In his press conference yesterday for the important game tonight at home against Manchester United, Steve McClaren mentioned that some of our players had a few niggles, but that Jack Colback should be available again after a slight hamstring problem. Some doubts exist over the fitness of Fabricio Coloccini (hamstring), Kevin Mbabu (thigh) and Florian Thauvin (ankle), but they all trained yesterday and we´ll see if they have any negative reaction to that. As far as the team goes for tonight, we are hoping that Kevin Mbabu will keep his place after his Man of the Match performance on Saturday at Watford and we expect him to come in for Paul Dummett at left back. What would your team be for the game against the Red Devils? About one in three fans think we can win this game. How Will Newcastle Fare Against Manchester United? Assuming you put Anita instead of Perez by mistake? No Perez on the team sheet 😛 Early morning blues..
Shola before Bender,thats the way to go,ok. Lots of responsibility on Sissoko and Wij to create in that line up. They need to have stellar performances tonight if we are going to grab an unlikely win. Hope that Bendtner rumour is just that. Can’t imagine why we would want to buy another big forward with no pace who is not exactly prolific. We already have a younger version of him with some potential. Speaking in exclusive interview with L’Équipe, Newcastle’s brand new signing from Bordeaux Henri Saivet commented on his move to the Premier League. In full. 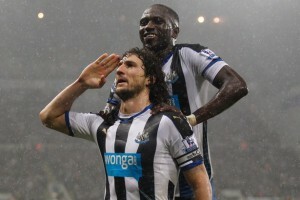 You were starting with Bordeaux, on Saturday, and already in Newcastle, yesterday, to sign a contract for five years. What happened for you transfer to have accelerated in such a fashion? It was already advanced, but we did not force things either. I knew that it would be without a doubt my final match for Bordeaux. But the transfer window is always very uncertain, it can be done in 24 hours like it can go on forever. At the end of the game, I still informed my teammates by telling them that there was a big chance that I would be going. Were you determined to leave Bordeaux? Very sincerely, no. I did not think that it would go this quickly. When I left for the holidays, I did not imagine that I would find myself this quickly here. Outside of Newcastle, you were followed by Bournemouth, Watford and Norwich. Why did you choose the Magpies? I knew that contact had been established with certain club but I wanted to solely concentrate on the pitch. But Newcastle, it is an exceptional challenge for me. To arrive at this moment in the season to help them climb the table, it is something very exciting. I am a guy who needs a challenge. I am someone who needs to measure myself up, to see what I can do. Did you hesitate about leaving in the middle of the season? I know that it is always delicate to leave during a season. At the same time, I have never left Bordeaux, apart from a loan to Angers. Besides, that was in the same period (January 2011) and it went very well. At Newcastle, you are joining a large French colony (Sissoko, Thauvin etc.) and some former Ligue 1 players (Cissé). Is that reassuring? As a matter of fact, I asked myself the question which club I would be able to adapt myself to the most quickly. Newcastle is in a state of emergency, I know that. But I say the squad and the number of former Ligue 1 players there. The answer jumped in front of my eyes. Newcastle are currently in the relegation zone. Does that not put you off? I have seen a fair amount of matches from Newcastle when the initial contacts were established, and I had time with Boxing Day! For a little while now, they are losing on the small details, often by one goal, it is a cycle of bad luck. I am convinced that it will turn around. Do you know in which position Steve McClaren plans to use you? In the central midfield position. I spoke with him, and he even surprised me. I did not think that he would know me so well, that he would be able to speak about my game with such detail. He has already shown me certain sequences of mine on video that he appreciated and that are important for the Premier League, according to him. For me, it is quite simply the most attractive league. Every footballer says it, I have friends who play in Spain who want to come here. The stadiums, the fans, everything is different. It is everyone’s dream, and in any case it is mine. We could just win tonight. Then West Ham at the weekend. Two home games what a way to start winning again. Things could look very different come Saturday night. Another few good signings and us fans might believe that we can start an upward march. Let’s get a few more through the door. Or over the line. Sissoko should be transformed into a CM. His strength and structure can be good for a box to box CM. firebug666 – nice one, thanks for the article. @willdie: no transformation needed. He’s a CM by nature. Saviet has already said he will play in the CM mate. Your Welcome, Interesting that he says he has a few friends in Spain that would like to come here (Premier League). Maybe we could nab a couple of them! “At the beginning of the season I did not expect the team to be in this position… I don’t think that any of the new players expected to be where we are. “We had ambitions to be up in the top 10 at least but this season has been a failure right from the very start. “The players are the ones who go onto the pitch and perform – it’s not the head coach or the fans who go out and play, it is us and we have to take all the responsibility, give 100% to make sure we turn this around. “I cannot predict the future but what I can promise is that we are doing everything to get out of this position. From a couple of threads back re Mitrovic and Thauvin. I hate that we r playing very good football and not winning. We have very good players we should play. Darlow, Mbabu, Colback Thauvin, De Jong, Aarons, Perez. The trio of Saivet, Shelvey and Tiote (now back in form?) is a vast improvement for our midfield. I first posted to you about 18 months ago when you were saying Martinez was great and Pardew shyte. It was you mate because I remember laughing at you mentioning your badges. I do agree with you often and not a problem but some of us did think Pochettino was the manager for us around 18 months ago long before the so called experts. Yeah I know mate, my point is you cannot just single out those two players, the whole team has to shoulder the blame. If Mitrovic got more chances in a game to score he would put some of them away, but the team have failed to provide him with enough chances. I’m hoping that some new signings this month will provide him with more opportunities. Thauvin gets a few minutes a game for the most part, so how can he be judged. It takes as long as he gets coming on as a sub to get up to speed in the game. The team need to buck up and they look like that is starting, now we need to feed the strikers and give them a chance to score.